PITTSBURGH—Carnegie Mellon University's John R. Anderson, whose human thought and cognition research has revolutionized how we learn, has been selected to receive the Association for Psychological Science's (APS) William James Lifetime Achievement Award for Basic Research. The award, APS's highest honor, recognizes Anderson's profound impact on the field of psychological science and his significant intellectual contributions to the basic science of psychology. "John Anderson is being recognized both for the importance of his theoretical contributions and for his success in transitioning his theories into widely used applications having great societal impact," said John Lehoczky, dean of the Dietrich College of Humanities and Social Sciences. "It is entirely fitting that John would be selected for the William James Lifetime Achievement Award, as he is among the very best scholars of psychological science." Anderson, the R.K. Mellon University Professor of Psychology and Computer Science, has been on the Carnegie Mellon faculty since 1978. His work combines cognitive psychology and computer science to understand how the brain works, how people learn and how computer-based instructional systems can be used as educational aids. In the 1990s, Anderson led a team that created an intelligent computer tutor to teach algebra to high school students. The program actually thought like a teenager and was so successful that a spinoff company, Carnegie Learning, developed computer tutors as a commercial product. To date, more than half a million students in 2,600 schools around the U.S. have used the tutoring software. "There have been a lot of well-intentioned, but unsuccessful efforts at applying computer technology to education," said Randal E. Bryant, dean of the School of Computer Science. "John Anderson, on the other hand, is the real deal. By developing models of how students learn, his cognitive tutoring technology has been remarkably successful. It points the way to how we can make high quality education available to all students." A notable example of Anderson's impact is the Pittsburgh Science of Learning Center (PSLC), a joint program of Carnegie Mellon and the University of Pittsburgh. The center, which will receive almost $50 million in grant support from the National Science Foundation, uses tutoring software to develop effective new means of teaching and to gather valuable information about the learning process from students in actual classrooms, not laboratory environments. 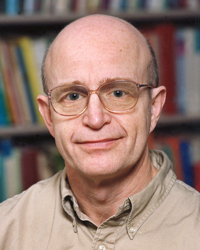 In 2011, Anderson was named a Franklin Institute Laureate and was awarded the Benjamin Franklin Medal in Computer and Cognitive Science "for the development of the first large-scale computational theory of the process by which humans perceive, learn and reason, and its application to computer tutoring systems." Previous honorees of the Franklin Institute's prestigious awards include Albert Einstein, Thomas Edison, Frank Lloyd Wright and Allen Newell, the late CMU professor and one of Anderson's mentors. APS will formally announce Anderson as the James Lifetime Achievement Award recipient in May at its annual convention in Washington, D.C.